Choose from the listings below and contact us as soon as possible to bring Judy to your group. Artistic Artifacts generally books out 1-3 years in advance, but are happy to accommodate a shorter lead period if mutual schedules permit. Travel through Indonesia with Judy Gula! The presentation begins with a 35-minute computer slide show including a wealth of photos of Indonesia culture and the many batik processes. With these illustrations, a discussion will be led on how Indonesian fabrics are created, including beautiful hand-drawn batik panels, batik fabric yardage, and sarongs. At the conclusion of the slideshow, your group will have a variety of batik fabrics and other Indonesian textiles to see and handle. A mini trunk show of art quilts that have been created with these wonderful batiks and panels will also be included. 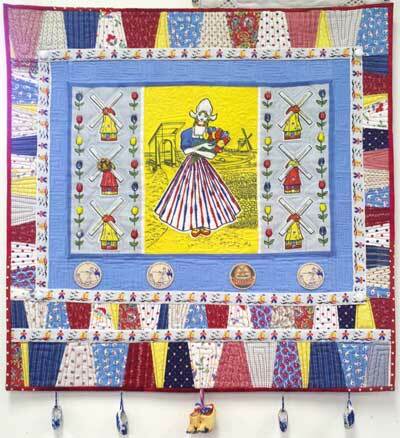 Judy enjoys using vintage items — including linens, laces, trims, photographs, and ephemera — to create contemporary art quilts. 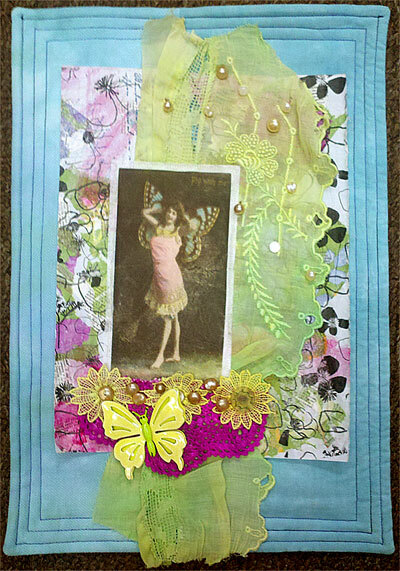 She has learned some tricks to working with vintage items which she will share with your group. The accompanying trunk show will include six Judy Gula quilts that were published in A Quilt Block Challenge: Vintage Revisited, a book authored by Mary Kerr. Judy’s art quilts are all embellished, whether selectively or lushly. In this lecture/trunk show, she shows off a variety of popular embellishments and explains how she has used them — and how you can too! Embellishments include Angelina fibers, paint, buttons, beads and more. Judy will also briefly describe the processes behind several surface design techniques: block printing with wooden printing blocks, monoprinting using a Gelli Arts™ Gel Printing Plate and more. These techniques result in beautiful, one of a kind fabric to include in your textile projects. Create a captivating art quilt with the mystery of the Mona Lisa and the intrigue of a Vermeer. Choose a photo or image that captivates you – think romance, elegance, and vintage (pictured here is Judy’s “Butterfly Lady”). To use a personal image in class, participants will be asked to email their high-resolution photo to sales@artisticartifacts.com a week before the workshop date. Bring your special linens and laces, or purchase one of Judy’s hand dyed inspiration packs for $24.00 (a selection will be available the day of the workshop or order in advance: see below). Participants will incorporate mixed media techniques, printed photos and image transfer, stitching plus will embellish with found objects...finishing with a one of a kind piece of fiber art. Embellishments can include buttons, jewelry (pins work great!) or other special items: search the online Artistic Artifacts store for items, place an order and Judy will bring it with her: free shipping and handling! In order to finish, it’s recommended that your group plan to work in small sizes for the class — nothing larger than 24 in. x 24 in. Kit fee $20, payable to the instructor, includes image transfers and a limited amount of basic fabric and vintage linen. Student supply list to be provided in advance. Block printing on textiles with wooden printing blocks (ours are hand carved in India) is an ancient art; one of the earliest methods of surface design. There may be faster ways to alter yardage with printing, but the results using woodblocks are gorgeous; textured and full of character. 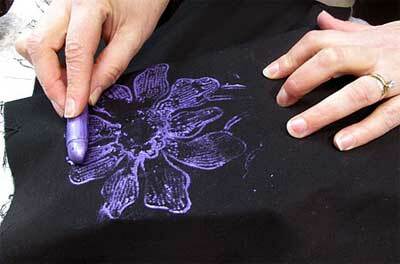 Turn your solid color hand-dyed and print fabric into one of a kind designs in this fun class. While some practice fabric will be provided, participants will be asked to bring 3-5 yards of their own chosen fabric (laundered, using no fabric softener, and ironed). Supply fee of $20.00, payable to the instructor, covers cost of practice textiles, Artistic Artifacts Textile Paints and full use of a wide array of hand-carved blocks. In addition, each student will receive one small wooden printing block and a foam printing mat to keep! Student supply list to be provided in advance. Create your own panels or fabric yardage from rubbings using Shiva® Artists Paintstiks® with vintage Indonesian copper tjaps. 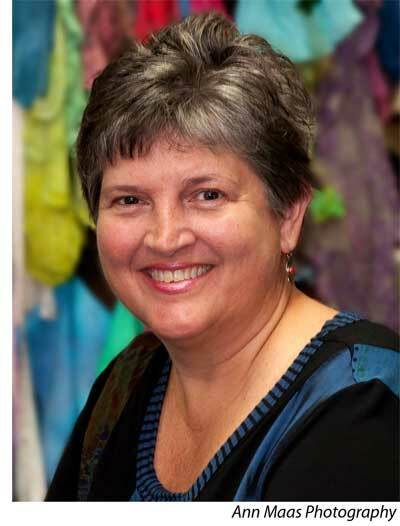 Judy will first cover some basics of working with Paintstiks and then guide the creation of one of a kind fabrics by each participant. Discussion points will include how to care for these new textiles and use them in future projects. (Due to the nature of Paintstiks, several days of drying time is required before use.) Supply Fee of $20.00 will cover use of Paintstiks, beginning fabrics, and use of tjaps. Student supply list to be provided in advance. Batik Tambal works with the leading artists in Indonesia to create their hand drawn batik panels. We will discuss how these panels are created in a cooperative process that is led by the artists. These handcrafted panels can be used to create both traditional and art quilts, home décor, clothing and more. Bring a batik panel that you already own or purchase one from Artistic Artifacts (a large selection will be available to you the day of the class), several coordinating fabrics and we will brainstorm ideas and begin your piece. Student supply list to be provided in advance. Embellishments: How Do I Use Them? Judy Gula portrait by Ann Maas of Ann Maas Photography.